Quick Finder: Quickly find the needed documentation by simply clicking on the topics below. 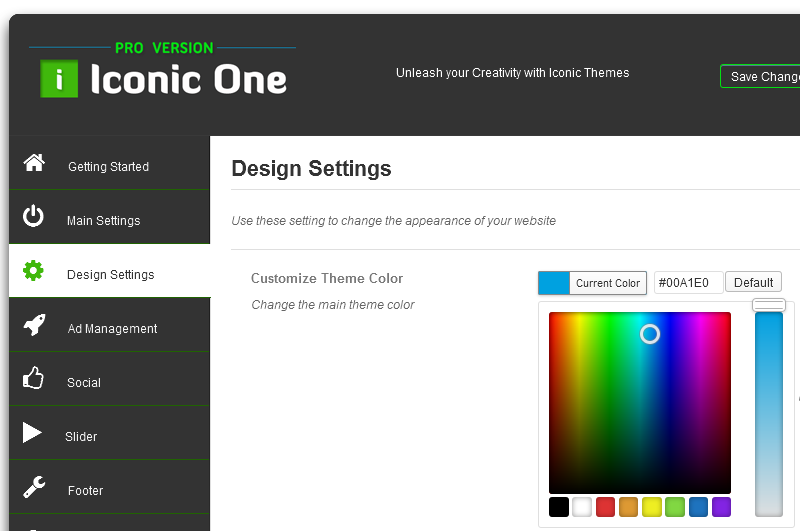 Welcome to Iconic One Pro online documentation, it covers all the aspects and usage of Iconic One PRO WordPress Theme. 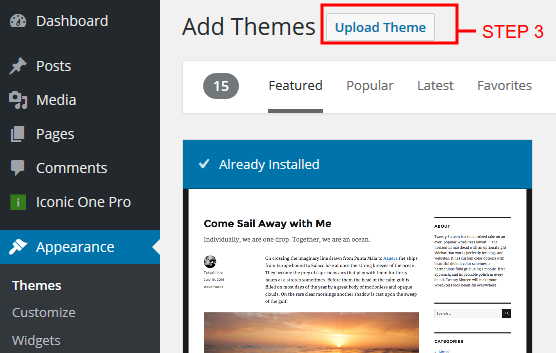 It has been written in a very beginner friendly approach, even if you are new to WordPress you can get up and running a complete optimized blog in under 5 minutes with Iconic One Pro. How to Install Iconic One Pro? to upload the theme’s zip file. For Mac users: Safari auto unzips the downloaded zip file. Simply use Chrome or Firefox browser to download the zip file as it is for upload. How to setup the Responsive Menu? 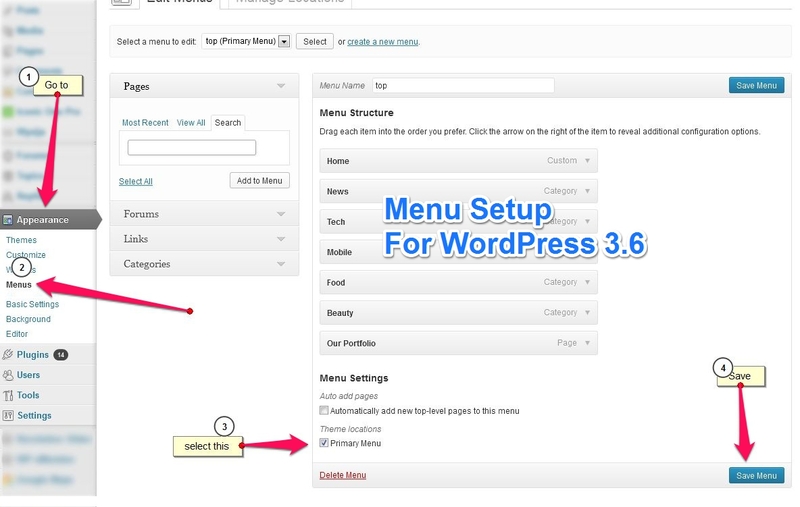 This means that you have not configured the WordPress menu system yet, to do this simply select your menu as “Primary Menu” by going to Appearance -> Menus, kindly refer to the following image and you will get it working in no time. Iconic One Pro supports the native WordPress Menu system that allows you to create custom menu even with external links and custom page links in just a few seconds. The Thumbnails feature of Iconic One Pro works out of the box for new installations, just make sure that you setup a Featured image for thumbnails to show. 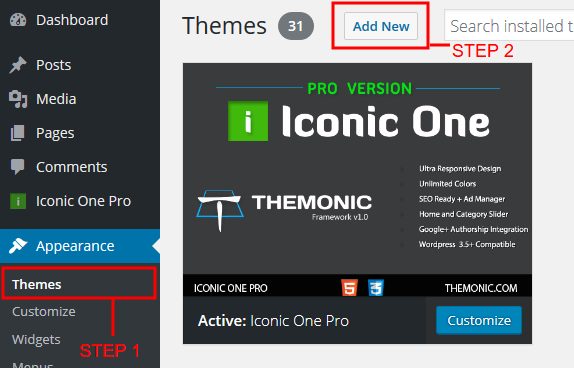 If you have an existing blog on which you are installing Iconic One Pro, all you have to do is install a free plugin name “Regenerate Thumbnails” and it will regenerate your previous thumbnails to Iconic One Pro compatible thumbnails. This will also fix the different size thumbnails issue in Related Posts. It’s a one time process which regenerates the older uploaded images, afterwards you can uninstall the plugin. If you want to show Featured image automatically below post title. Go to Theme Control Center -> Main Settings -> 3rd option and turn it ON. Note: If you do not understand what Featured images are and how they work kindly leave this OFF. How to upload the Logo? 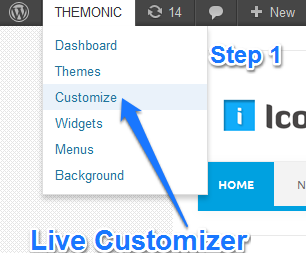 Easily upload the logo from the Live Customizer, it will replace the site name and description. How to upload header image? How to setup Google+ Authorship and Author’s Page in Iconic One Pro? Go to Your Profile to enter your Google+ profile URL. We have made it very easy to enable proper Google+ rel=”author” markup, simply fill out the profile field of Google+ in the User Profile fields added by the theme, these are available inside the Dashboard Menu -> “Users” or go directly to (yourdomain.com/wp-admin/profile.php) and link your Author page from your Google+ profile and your profile image will start appearing in Google+ search results in a few hours. Make sure the profile picture has a recognizable face otherwise Google’s automatic algorithms will reject it. 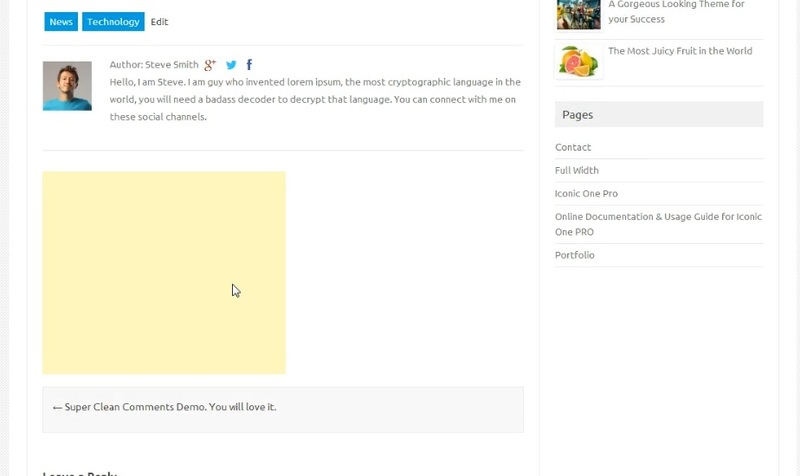 It is used to display author profile thumb on Home page : It uses Gravatar profile image associated with the respective Author email address in their Profile. Author Image is not displaying? Go to Gravatar.com and register a free account, after that you will be able to associate your profile picture with your email ID. Author Bio Not Appearing below posts? 1 – Your blog must have more than one author. 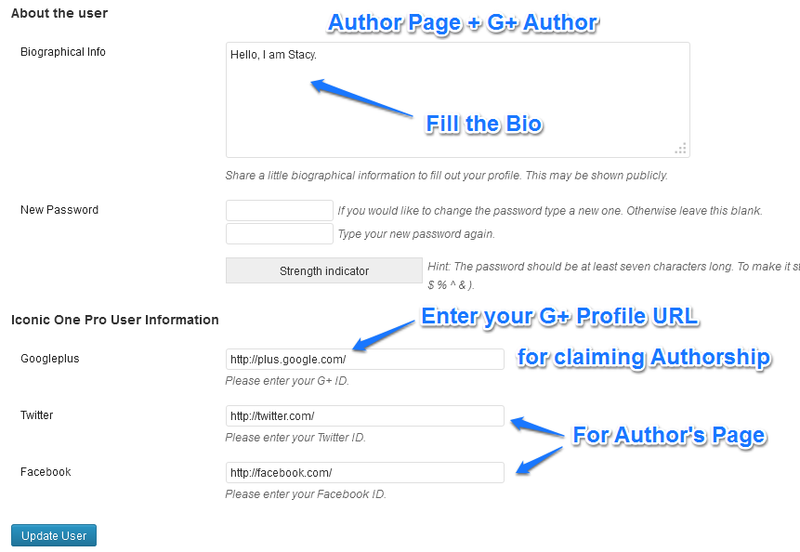 2 – All authors must have filled in profile bio. How to setup Top Social Media Links in Iconic One Pro? How to Hide Top Right Social Media Links in Iconic One Pro? Leave the respective social URL field empty and then Save to hide, the changes will appear instantly in the live customizer. How to setup Social Media sharing buttons in Iconic One Pro? All Social Sharing settings are available in the “Social” tab inside the Theme’s Option’s Panel. 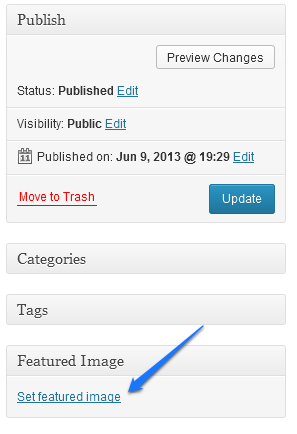 Simply Enable Social Sharing and then select which sharing services you want to show at your blog. How to Install Adsense advertisement? Advertisement settings are available in the “Ad Management” tab inside the Theme’s Option’s Panel. For eg. if you want o show an Adsense unit below the Article Title simply enable the Below Title #AD1 area and paste your Adsense code in the HTML field section that says #AD1. Dont’ forget to save the settings. How to use Responsive Mobile Ready Adsense Ads and AD Locations? All Ad locations in Iconic One Pro support Responsive Adsense Ads, simply select the Responsive Ad unit in Adsense Ad panel while creating new Ad unit. Yellow areas in the below screenshot shows the Ad areas available in the theme which can be managed by going to Control Panel -> Ad Management. These Ad areas can also be used for custom banner advertisements: First Two Ads in the screenshot below can have 1040px max width, next two in-article Ads can have max width 655px. To add spacing below your Ads simply add <br> after your code. How to Enable and Setup the Sliders? Slider settings are available in the “Slider” tab inside the Theme’s Option’s Panel. There are two sliders: 1) Home Page 2) Category Page . Home Page slider has an extra option to select a category from which the posts will appear in the slider at the home page. Category Page slider will slide posts from its respective category. For eg. Food Category page slider will slide images from Food Category. Slider setup: Slider slides the featured images from posts. If your website is new: first create some posts with their featured images set -> assign those posts to some category -> select that category by going to slider settings in the control panel as shown above. 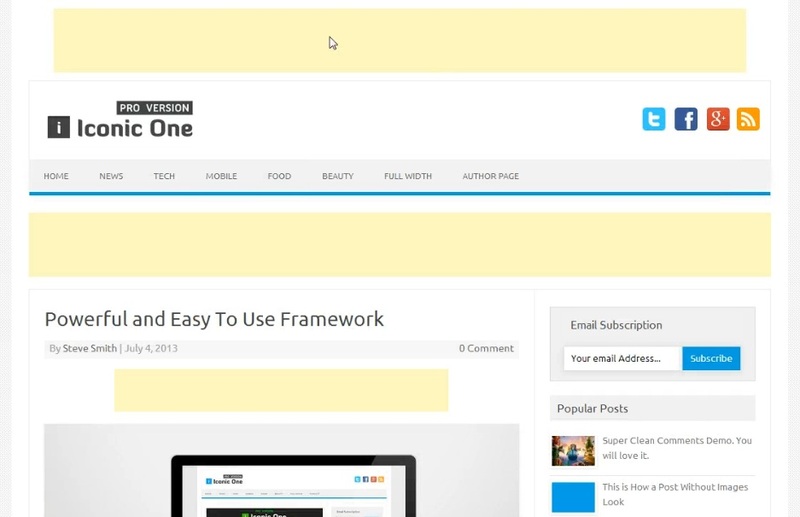 Using Slider on Static Home Page: Simply select the slider page template. How to Setup Google Analytics or Statcounter for tracking page views? Tracking code installation settings are available in the Footer section in the options panel, activate the area and then paste your Google Analytics or any other service tracking code and hit save. Footer is the best area to install tracking code as it will load after your content for better visitor experience. How to remove the credit link? Go to the Footer tab in the Options Panel and remove the tick from the Footer Credit link option, screenshot given above. 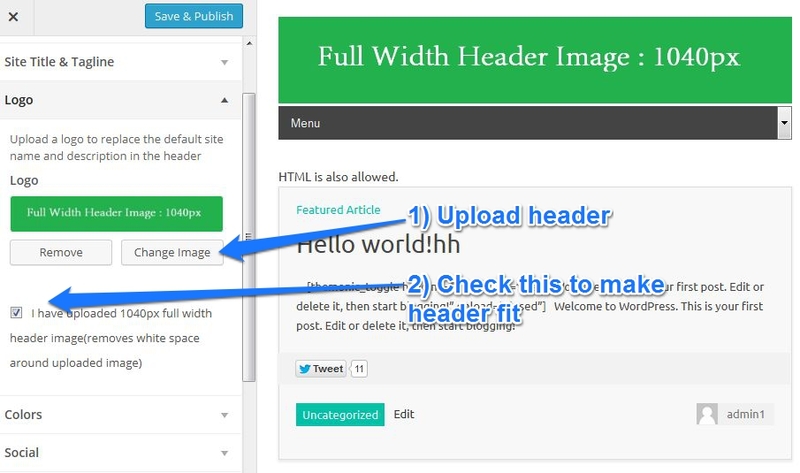 How to install Footer Widgets? Go to Theme Options Panel -> Main Settings -> Activate Footer Widgets. Now to place widgets go to Appearance -> Widgets. Here you will now find three areas: Footer One, Footer Two and Footer Three. How to setup Author’s Page? To enable the Author’s page like in the demo, simply fill out the Author’s Bio and Google+, Facebook and Twitter fields added by the theme in user’s profile field. If your blog has multiple author, they will have to go to their profile page and fill our their details. See the Google+ Authorship Image for reference. How to setup the Contact Page? We recommend a free plugin “Contact Form 7”, create a new page and paste CF7 shortcode. It’s very easy to install and use. How to upload Favicon and WP-login page logo? For this Go to the Design settings tab in the Theme’s Option’s Panel. How to change the Iconic One Pro theme color? For This Go to the Design Settings in the Theme’s Option’s Panel. How to Show the Email Subscription in the right sidebar? Drag and drop the Email subscription widget added by the theme to the sidebar. For the subscription to work make you have enabled ’email subscription’ in your Feedburner account. Note: You just have to enter Feedburner ID only not the full URL inside the widget else it will show this error “This feed doesn’t have subscription by email enabled”. How to use the Inbuilt Page Templates while creating Pages? How to use Slider on Static Home Page? 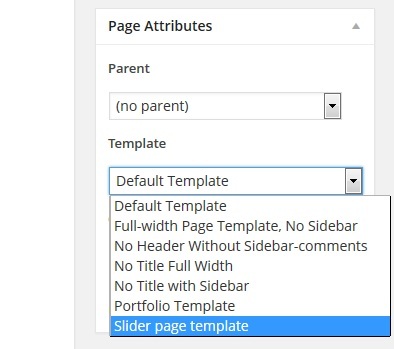 Simply select the Slider page template for the page you have set as static home page. How to Show Related Posts with Thumbnails in the sidebar? See the above image for reference, Drag and drop the Related Posts with Thumbs widget added by the theme to the sidebar. How to show Popular Posts with Thumbnails in the sidebar? See the above image for reference, Drag and drop the Popular Posts with Thumbs widget added by the theme to the sidebar. How to Enable Breadcrumb and Pagination? 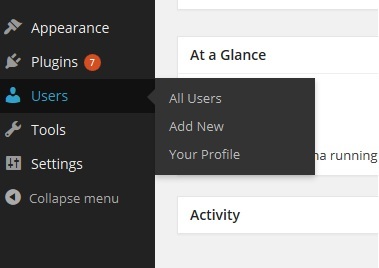 These settings are available in the Main Settings tab in the Theme’s Option’s Panel. How to change the Background Color or Background Texture image? Select the background color from the Live Customizer. You can also upload your Background texture image from the Live Customizer. Why some Iconic One Pro Settings are in the Live Theme Customizer? These are available separately because if you have to reset the framework options panel your website will still remain perfectly functional as all the settings that are present in the Live Customizer will be saved as they are independent of the options panel. These are the bare necessities that should not be affected should you choose to reset the framework options panel. Besides, this is a one time setup. How to install the recommended plugins? Go to Plugins- > Add New – > Search and install. Recommended plugins: Contact Form 7 for creating an easy contact page and if you are installing on existing website then Regenerate Thumbnails. Similarly, you can install the other plugins too. This documentation will be updated regularly. – Created on July 13, 2013. – Last Updated on: December 28, 2015.